How did you get into making films? After having worked in TV series among which I won an “Emmy Award”, and also have worked in film and commercial advertising, I decided to develop my own projects in a deconstructed and independent way, with people who joined me in the interior of Uruguay, where I was born. There I found a hungry group of young people willing to do, without more motivation than to demonstrate that it was possible. It was then that without money and support we did in 2015 "Peste en Birra", winner of an award in Uruguay and as best foreign film at the “Cacho Awards” from the Argentinean magazine "Cine Fantástico y Bizarro”. That motivation made that in 2016 we made "Peste en Tacua" that could be seen in several countries. 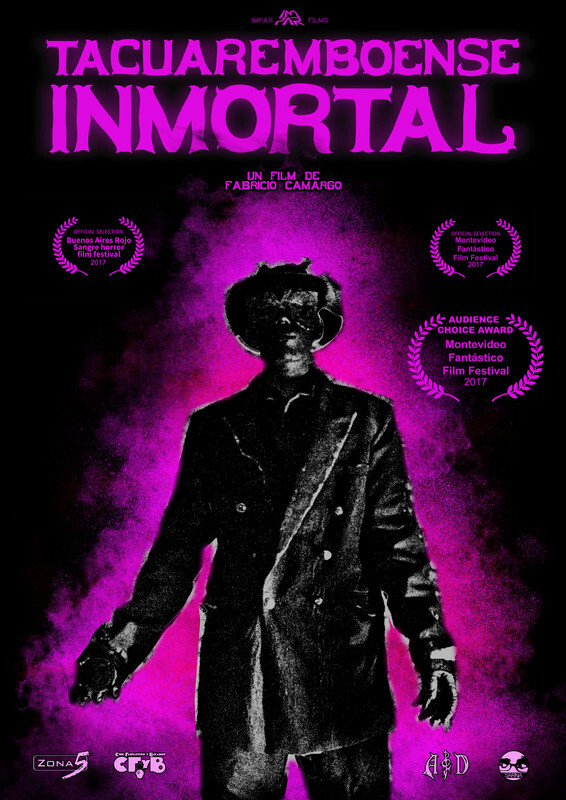 Finally in 2017 we started a more solid project as a team with "Tacuaremboense Immortal" recorded in Uruguay, Argentina and the United States and that has already been seen in BARS # 18 (Arg) and in Montevideo Fantástico Film Festival where it won the audience award for best film. What inspired you to make your movie? All the films that I have written are inspired by facts of everyday life, that I show them in a fantastic or bizarre way, in this last film we try to show how the system of local recognition works when a famous person dies. When in life nobody recognizes it, but “post mortem” all profit with their image. In our daily environment it happens a lot, and we have lived it since we were very young in Tacuarembó. That's why we wanted to show that, using the Gardel’s image who has fed many people. Unfortunately people here, prefers to honour a deceased, before support their own city talents. And that’s the reason of the culture’s stagnation. That ingredient mixed with humor, terror and tourist blasphemy, along with the fair dose of classic movies serial killers and supernatural terror results in a fun movie about a sad local reality. How has your style evolved? From 2015 until now I have been controlling details and aspects that not before, always letting the team be part and that the film is everyone's. Every time we have more fun but with greater professionalism. We have generated a solid work and a sense of belonging. Nobody has done in Tacuarembó what we achieved, and much less without the support of the local government and that makes it more intense. The way of writing has changed, it has become darker at times, without neglecting the humorous tinge that characterised us from the beginning. Those who have seen the evolution of my films have noticed that in three years there was a positive change, we have been very well praised with this latest work. Tell us any strange or funny stories while making the film? The most difficult moment that we had to live in the realisation was when we met to stop recording, because the shooting was surpassing us in terms of work and responsibility, and some of us were beginning to stop enjoying it. But, between sadness and tears, the team returned to resume the work, because that was decided by the majority and that gave us the strength to continue doing. That made us stronger, we learned from our mistakes in an extreme situation. We all knew that there was something we did not want to happen: stop doing the movie. That marked us a lot, since there are always fun moments, many are recorded. A great moment for our career has been the support that this film received from Argentina with SARNA CINE, CFyB Magazine, ZONA 5 and ANGELS AND DEMONS BAR, that made us feel that we were not alone, in addition to filmmakers and actors that joined our movies, we always remember them as great friends. An epic moment was when we premiered in the "Buenos Aires Rojo Sangre" in Argentina, it was when the audience began to applaud a scene of a character’s death. There we understood that we had made a good movie. The Misrule Film Movement & Pink8 manifesto bring what to mind? I like to think that many of the things that the “Pink8 manifesto” says, we fulfil them exactly, sometimes in a fortuitous way and sometimes intentionally. I think that all the filmmakers that generate a group like the one we have with IMPAR films have a manifesto, although it is implicit work. Ours is based on enjoying work, horizontal in roles, nobody is more than anyone. And I agree broadly with the last item of the Pink8: Answer to one person only-yourself. What can we expect from your next film? I want my next movie make the audience get up from the chair and leave, close their eyes so they do not see and laugh until they cry. The cinema is an art and if art does not provoke sensations it is simply an adornment. I also want my next film have the criticism that makes the gentleman behind the desk feel uncomfortable because of his mediocre work with public money. The cinema is a great tool to say things, we say them in Tacuarembó several years ago, even though there is no a movie theatre to show movies.